Jake had an incredible ability to sense the energy of everyone around him and adapt his personality to suit. He was the most fun loving dog you would ever meet. He absolutely loved Christmas and would go berserk when we started to get the boxes out from the attic each year. He loved decorating the tree. He would proudly wear his antlers and the light up Christmas collar the kids put on him and join in with every activity. Especially opening presents on Christmas day. He always had an incredible nature with the kids and was the most patient dog you ever met. He put up with sharing his rawhide bones and being poked, prodded and used as a pillow. He had the most joyful personality. He was always up for whatever you wanted to do and would let you know he was incredibly disappointed on the occasion he was not going to be included. I could never imagine what a great friend and partner he would turn out to be, especially with when I was coping with the move to New Zealand. then when the kids came along he was just as willing to love and accept them as he did me. we are all missing him so much still. but we will be eternally grateful for the friend you gave us. We did post the news of his passing–Click Here to read that and to see more photos. We feel the loss with you, as do so many readers. Thank you, for giving him such an excellent life. Hey guys, Geoff and Fallon here with Molly (Mouse x Blue). I have a real brief question for you regarding nail care. Do you guys have any tips for keeping these weim nails from doing any kind of breaking/fracturing? Molly, being the One-year-old weim she is, has been playing fetch with as much energy as ever. Every couple weeks she will get a good size sliver of nail try to break off or split down toward her paw. None of them have been too severe, and none of them have slowed her down in the slightest. However, despite trimming them down fairly often in an attempt to prevent it, think just the sheer amount of speed they run and redirect with makes it easy for them to catch their nails on a piece of root or rock and break it. Are there any particular methods you’ve used to combat nails from getting damaged in the past? Thank you for the news of Molly. Sorry to hear you have some splintering going on with her nails. Good nail care is complex and sometimes hard to manage. Here are some general thoughts—not just for you. We hope something here helps. Nail and Skin are areas you might notice if something is lacking in the diet. We recommend a grain-free diet combined with the NuVet Supplement. There are products meant to protect the pads and nourish the nails. One of these is called Musher’s Secret. You might consider adding a teaspoon of coconut oil to the food once a day. It is excellent for the skin and nails. You could rub some into their paws as well. Make sure the nail clipper is high quality and sharp. A nail grinder is an option; however, there is a learning curve. A well-groomed nail is a must. 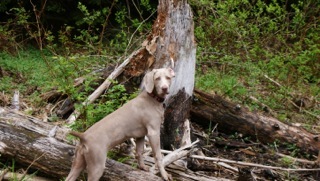 You can take the Weimaraner to a groomer or your vet office to have a professional trim the nails. The traditional Weimaraner Breed Standard calls for tail docking. That being said some folks are in love with the idea of the undocked tail. In some places, the European undocked Weimaraner is the law. Here is Indi. He lives in the UK and for fun, we will mention he is related to OwyheeStar. We receive updates and photos. He was born in England and thus sports the undocked tail. The undocked tail in America is controversial much like tail docking in other parts of the world is frowned upon. Regardless, some are set on finding the undocked–to our surprise this has even included a serious hunter. Proponents are adamant while those who believe in docking (for health reasons) hang tight to America’s choice. It is a choice unless you are going to show your Weimaraner. Then, you must comply with the Breed Standard. OwyheeStar does accommodate those who wish to get the undocked tail; however, there are some stringent criteria. For one thing, we require a 50% deposit up front because if you fail to follow through this propels the pup (and OwyheeStar) into a series of events that require extreme measures. There is not an extensive list of folks waiting for the full-length tail. So, placing the suddenly available pup is not an easy option. Tail docking is done very early for a number of reasons we won’t discuss here; however, later tail docking is harder on the puppy and requires a surgical procedure. A scenario we want to avoid. The Longhair Weimaraner sports the full tail. Some hunters have fallen in love with this bird-flagging tail. It is another option for those who wish to have a long tail. Once again we want to mention that the feathering and extra hair is not as you might imagine. Your clothing, furniture, and whatnot are not covered with hair. Max (pictured here) has a bit more fluff than some of the Longhairs. His tail has ample hair to protect it from inadvertently being damaged. Click here to read a pro-docking article with graphic photos. All dogs shed. Many people are drawn to the Weimaraner because of their sleek coat. The smooth coats have eyelash-length hair. A lot of people who have been living with the Labrador (which is ranked as the most popular breed in America) arrive at the notion of getting a Weim in order to escape the barrage of hair. The Labrador leaves hair on your clothing, furniture, and everywhere they go. All dogs do, but the Lab leaves copious amounts of hair according to owner reports. Brushing and a good diet will go a long way to limiting the amount, but you cannot escape it. Plus, they have an oily residue that they leave on fabric, carpet, and the wall (they lean against). Photoperiod–the duration that a plant or animal is exposed to light during a twenty-four hour period. We learned about light in our science classes. We know it affects plant growth. Light also has a dramatic effect on animals; it is the main contributing factor in the shedding process. How often have we heard someone remark on the kind of winter we are going to have, basing their comment on the fact that animal coats are heavier than usual this year? We talk as if weather patterns are the cause of coat density, but in truth, coat density and shedding is directly related to light exposure (or more specifically the photoperiod). Season changes bring longer days in the summer; short days happen during the winter. As winter comes, and the daily dose of light begins to wane; the summer coat is expelled. It is then when your pet grows a thicker winter coat. There is a direct correlation between light and shedding. I don’t need a bath! It is true this coat-change-cycle is hardly noticeable in the Weimaraner, but the cycle does occur. You will never get away from hair loss if you have hair-producing living creatures (humans or pets) in your household. That being said, the Weimaraner is easy to groom, and you do not find hair on your clothing, furniture, and such. When the Weimaraner gets wet, they are dry fairly quickly. Depending upon your personal neatness factor, even a muddy Weimaraner will dry and brush clean. If hair is a problem, then you might want to opt for fish or birds. Then again, they have their set of issues too! Pets inconvenience us. The trouble they cause is small when you consider what they add to our lives. The reward of their unconditional love outweighs all we do for them. Frequency of grooming will depend upon several factors…. Your neatness factor is the primary consideration affecting the grooming schedule. Your lifestyle. If you live where there is mud, and certain dry weeds that can get caught in a short coat, you will need to brush them more often. If you hunt where there are ticks, they need a good brushing and check after each trip out to the field. Rolling in muck calls for a bath. I am not getting in the muck, promise…. We suggest brushing once a month (at least), a quick weekly brushing would remove almost all the loose hair. The Furminator is an amazing tool. Click here to read more about it, and to purchase one! The Longhair Weimaraner should be groomed twice a month (minimum), and in truth, the shedding is insignificant in light of other breeds. The longer hair exceeds the eyelash-length hair that covers their body. Yes, there is more grooming with the longhair; however, it is easily kept in check with a little grooming. (Unless your little gem rolls in muck, and is attacked to every stink-pile in the county.) Again, if you are an excessive neat-freak, a dog of any kind is probably a stretch. Excessive bathing is not conducive to skin health. Bath no more often than necessary. Use a gentle shampoo. A light conditioner on their skin, coat, and pads is a plus. You do not want a heavy conditioner, but a light one can help prevent problems. We light to apply this directly after the bath while they are still damp, and work over their body. Swimming counts as a kind of bath. It is important to remember that the Weimaraner doesn’t have the oil secretions you find on the Labrador (and many other breeds). Over bathing can dry their skin, and deplete the coat of nutrients it needs to shine. 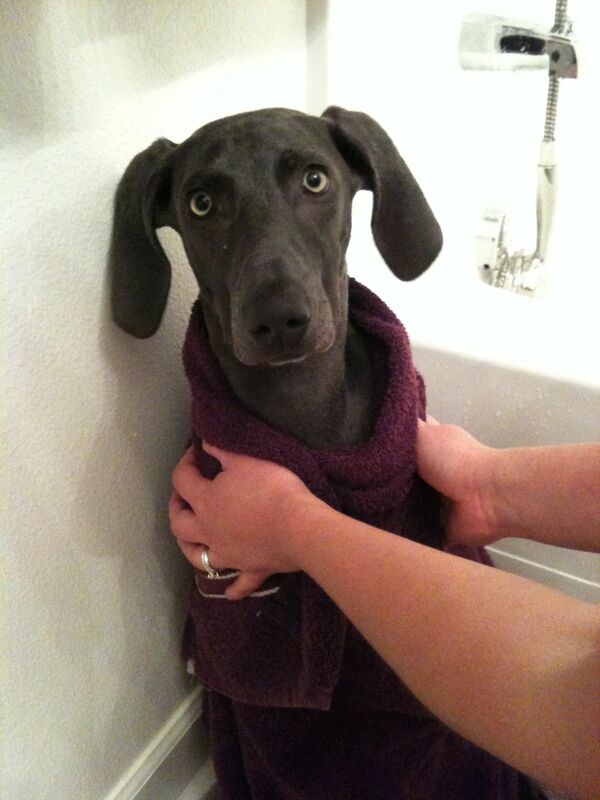 If you rely on someone else to bath, brush, and trim your Weim’s nails, be sure to request gentle products. 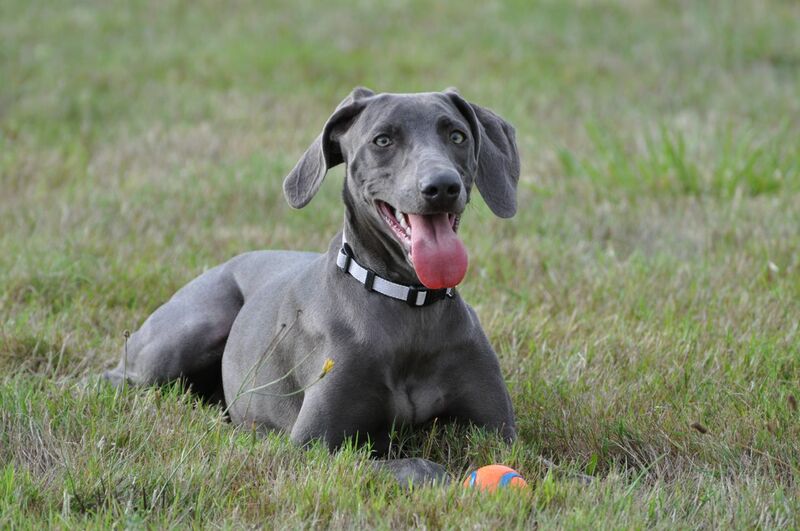 Many Weimaraners do not tolerate natural ingredients, such as Tree Tea Oil, Eucalyptus, and Jojoba oil. Natural doesn’t mean it won’t irritate, or deplete important natural-occurring moisture. The Weimaraner is prone to allergies, and these natural additives are potential problems. Keep the grooming to a minimum. Try using waterless bath spray, but check the ingredients. If you cannot manage to do these things yourself, enlist a groomer’s help. Grooming battles are best avoided. 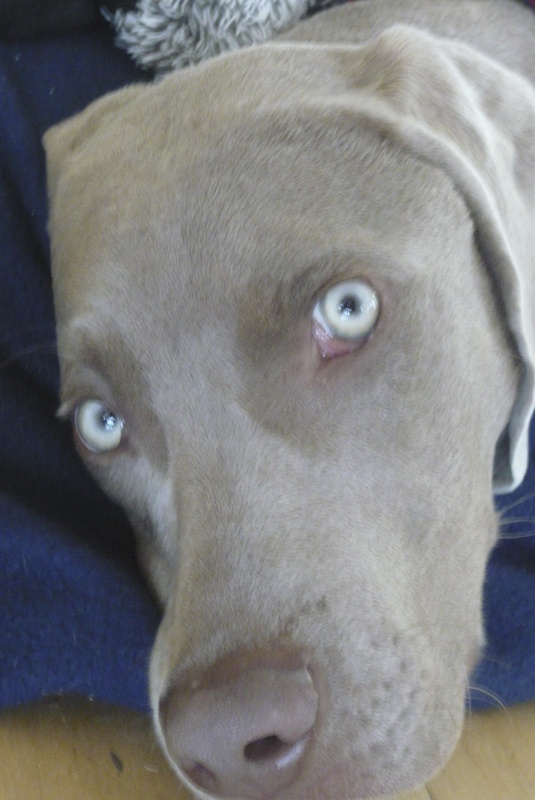 Yes, it is smart to have a relationship with your Weimaraner in which they respect your wishes. Nevertheless, not every Weimlover is equal in their ability to handle these tasks. Focus on the fun stuff, and master the lead. Respect in these is more important than being able to handle the bath, nail trim, and brushing. Even if you cannot handle the bath and nail trim, you might be able to manage the brushing. This can go a long way toward keeping them cleaner. Brushing usually will eliminate all visible hair in and around the house. This is what attracts a lot of folks to the Weimaraner; however, once hooked on the breed, it not what keeps the Weimlover loyal. Note: Thank you all for writing to us about products that work for you! We are always happy to get these tips and look forward to passing them along. Breezy still comes to school with me on occasion. I have to be careful as she draws a lot of attention and can be a distraction. When the students aren’t around, I’m more prone to bring her in with me. She is crated for a portion of the day, but I’m intentional to give her at least an hour of real exercise EVERY day (rain or shine). Living in a townhouse, this is a commitment I’ve made from day 1 to maintain sanity for all parties! We usually go to a field and play fetch. She recently learned to catch a frisbee, which has been fun. 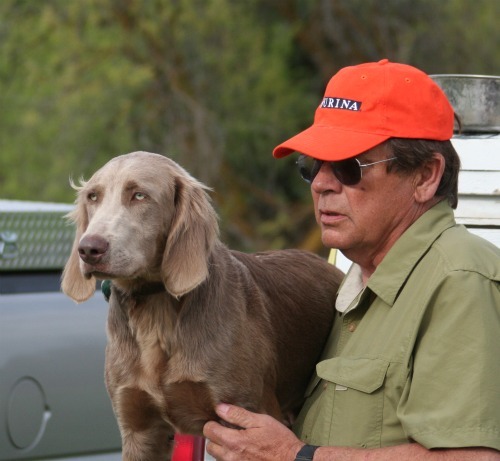 My father-in-law, who is a professional photographer in Walla Walla, came across this article about photographing Weims. Though it’s more on the professional side, I thought you’d appreciate a professional’s perspective on the challenges of photographing weims. I sure you’re plenty familiar with such challenges! Are you sure I need another bath? Sara and I picked up one of these gloves (see link below) a few weeks ago and have been very happy with it’s performance. Breezy’s short hair makes it hard to find a grooming brush that can get the job done. I also have a soft bristle horse brush to take off the dirt (works well). Anyways, just thought you’d appreciate a recommendation to pass on if asked! Note: JP & Sara are extra ordinary in ever sense of the word. No, their living situation is not ideal. Regardless, they went to extreme measures to raise Breezy. Their commitment is beyond question. Early on Breezy went to work. 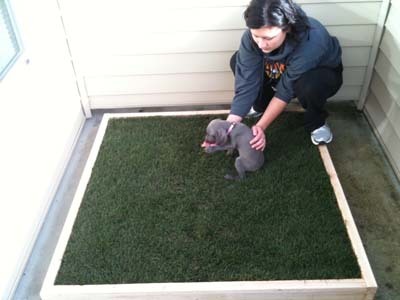 They maintained a sod box for quite some time to ensure she had a safe and convenient potty area. Maintaining a sod box is no easy task. 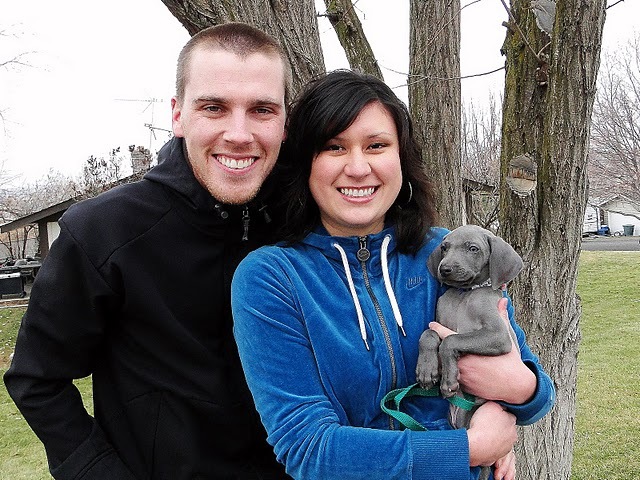 Add the commitment level require to raise a Weimaraner puppy, and it is incredible what they have done. They are not alone. Although traditional wisdom says that the Weimaraner should never be placed without a securely fenced yard, there are exceptions to any rule of thumb. This is one of those exceptions when having the perfect situation, with the ideal yard doesn’t insure success. Breezy gets love, attention, and exercise. She is a vital part of the family. JP and Sara are a good example of how an unlikely situation can work with depth of commitment. The days of the sod box are gone, but the commitment goes on forever. Thank you both for being faithful! JP and Sara have improved on the sod box that you see here and maybe one day soon we can share that information with you! Our Mailbox is often filled with questions about coat length, cleanness, and shedding. While the Weimar is possibly one of the cleanest dogs on the face of the earth they still shed and make messes. For years we lived with Labradors (BTW the most popular dog in America for more than a decade). The Labradors were fewer in number but nevertheless our co-existence was graced daily with more than tail wagging. Signs of their residence were everywhere–on our clothing, floors, and even the walls. For the Labrador, walking down the hallway meant rubbing the wall every inch of their trip. It also meant they were leaving their daily deposit of hair along the baseboard and an oily discharge on the walls. Despite the hair and oil, for many people the Labrador is a better choice. For us, however, though we also love the Labrador we do not nor ever will miss the piles of hair. We will not miss the oily residue either. The Labrador by no means is the worst doggie housekeeping nightmare. For the vast majority who like medium to large breeds it is the number one choice. For this reason the Labrador makes a good comparison. Most people are acquainted with the Labrador or have lived with one! Living with one or two Weimaraners normally means little to no sign of hair on your clothing, furniture, or the floor. The vast majority of those who live with Weims, allow their Weims on their furniture and many allow them in their beds. 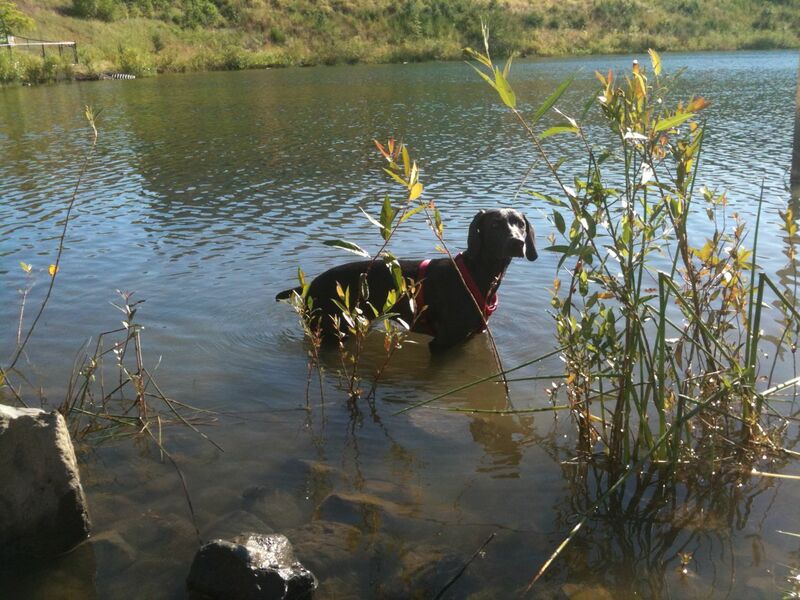 The Weimar can go swimming and during the summer and dry very quickly. Most of the time you will find they are ready to load shortly for the trip home. It is a a safe bet that at least 50% of the new Weimlovers are first attracted by their looks and the smooth coat. The idea of less hair, less dirt, and their clean-look is a magnet. Do not, however, be deceived. They can make a mess of the residence in other ways. Other ways such as raiding your trashcans. This could end badly on so many levels. Chewing the walls, furniture, or getting into things on your counter. We normally recommend that you start off with crate training. In this way you can teach your Weimaraner how to embrace the crate as their own and avoid a lot of behavior issues. JoJo has holes in her mouth?? 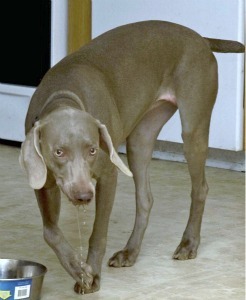 Weims can be messy with their water and food. Some more than others will slosh water and food everywhere. 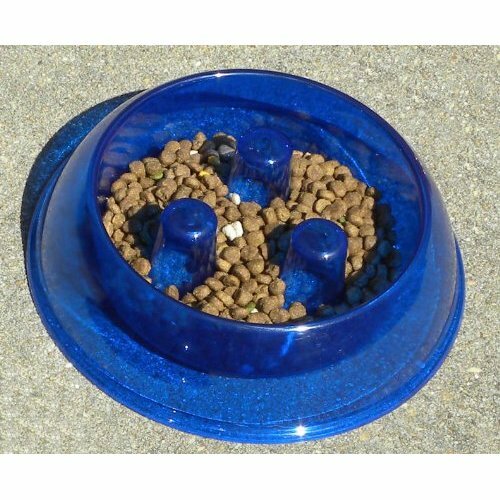 This issue could be avoided by giving feed and water outside on the deck or patio. For some who live in cold regions this idea will not work. Non-tip bowls can help prevent food pans that get turned over. The one pictured to the right also has pegs to prevent gulping their food which could lead to bloat. Weimar Lips with holes like JoJos (pictured above) have no cure. If you have a Weimaraner you need a sense of humor. A clean car, house, and clothing may be dear to your heart but expect a certain amount of mess and inconvenience. It goes with the territory! 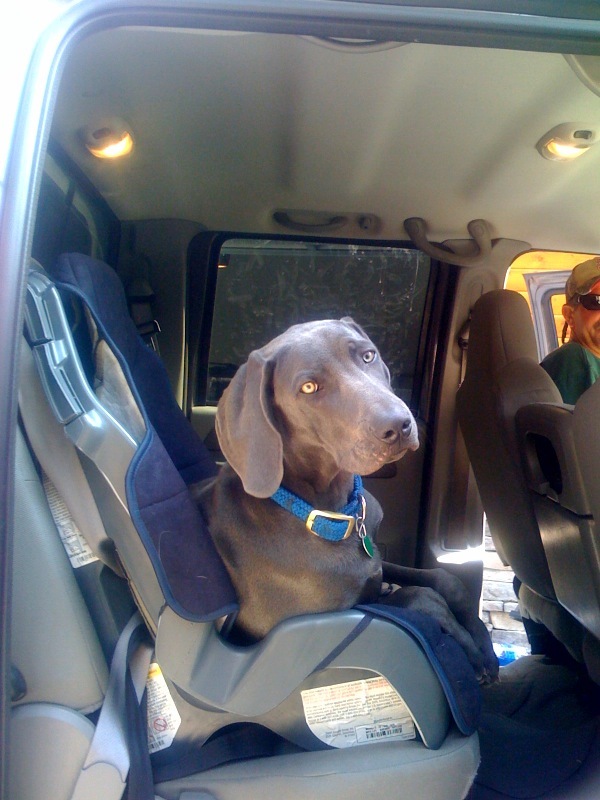 Deuce is a Great Weim..
Shela, First thank you and Cliff for the BEST DOG! Deuce is an amazing animal. Tommorow is the much anticipated second hunting season for deuce. In his daily run yesterday, he tore off the end of a toenail. I can get it stop bleeding, however it will start again when he’s active. Do you have any suggestions for covering or taping methods? We’ve been working hard to get ready for the dove season and I don’t want him to miss it. There are many good products that can stop a toenail bleed. We like to keep some in our First aide kit. EMT and Dr. Golds both make great products you should keep on hand. In a pinch a person can use flour. There are also styptic powders. Once a toe nail has a tear then it is important to get it well healed before putting too much stress on it. A boot might be necessary to protect the foot until the toenail is totally healed. Musher’s Secret or Udder Cream massaged on his feet and into the nails might offer protection and make then more durable. Note: these products are good to have on hand for regular nail grooming. Sometimes you can cut too deeply and quick the nail leading to blood gushing from their toe nail–not to mention pain. EMT and Dr. Golds have a numbing agent that will help with the initial pain too. The most important thing is to get the bleeding under control. Pet Guys offers both the Dr. Golds and Powdered Styptic. If you order be sure to mention you saw it at OwyheeStar because sometimes Pet Guys does nice little extras for us. Thank You! We hope Deuce gets better soon! PROVIDE A HOME. . .NOT A LITTER! Cow pies, carcasses, and gunk..
Why do dogs roll in cow pies, carcasses, and other stinky gunk? The simple answer would be because they can, however, even though true that is silly. There is no one reason or simple answer. Some behaviors (such as prey drive, mouthing, and marking territory) are deeply engrained survival skills. Survival skills they employed in the wild. Today, these skills may not be readily appreciated behaviors for our domesticated best friend. Many experts suggest that rolling in cow pies, dead stuff, and other smelly gunk serves to mask their own scent. Those of us confronted with the stench of a wet cow pie aroma can attest to its masking ability. The dog covered in pooh scent is certainly an ‘oh my moment‘. Although now domesticated and not hunted by other dogs, cougars, bears, and wildlife the behavior continues. In some locations the predator list might include alligators. We are not sure if alligators have a strong ability to scent prey but it seems fresh and salt water occupants rely heavily on scent. Oh and we must not forget sea lions and seals that can prey along the ocean edges. Unsuspecting dog owners have had an occasional pup devoured. There are many dangers out there which could prove a serious threat to a dogs existence. Dogs in the wild mask their own scent in order to sneak up on prey. Dogs in the wild mask their own scent to go undetected. Those two things might sound identical, however, they two entirely different purposes. If a predator is looking for dog-meat you don’t want to smell doggy. If a competing stud dog is looking to thin competition you might want to avoid fighting. Fights usually erupted during the female heat seasons but defending your claim to a certain area or females would have been important. A smaller and less experienced stud might be quick but not ready to take on the established area zoltan. For this reason, eluding them might be be the choice. The primary survival skills are eating, reproduction, and staying alive. Survival of the fittest also involved survival of the smartest and most cunning. Today, we often get glimpses of the clever behaviors that allowed our domesticated dogs to survive and even flourish. It is clear that although no one knows with absolute certainty why a dog rolls in smelly stuff they do. They not only roll in it they seem to enjoy it too. Sometimes a person feels as if they are so proud of their deed. They seem to not understand our less than happy reception. Regardless, it is clear big or small dogs often roll in things we would rather avoid having to shampoo from their coat. Here are the theories or the reasons for this undesirable behavior…. To mask their own scent. To announce their find; or advertise their success in the hunt. To cover up the perfume you just sprayed them. Likewise, to get rid of the shampoo smell. To rub or apply their own scent or body odor onto other objects. This would be another way of marking their territory or announcing that they violated another dog’s territory. Fortunately for us humans, they don’t only roll in smelly stuff. It may seem that way at times. Your Weim probably rolls in leaves, dirt, and grass. Every roll doesn’t seem to smell horrid. So that brings us to the question is it totally about the scent? Possibly they just enjoy rolling their back on the ground or the feel of leaves. They may enjoy all kinds of scents. We will never totally understand or know what causes them to roll. Rolling is not such a huge problem in and of itself. What is hard to deal with is their smelly choices. Dead carcass smell is one of the worst and hardest to remove for their coat. Although skunk scent is equally bad and difficult to remove it is not obtained by rolling. Nevertheless, the recipes or products for removing skunk scent will help with dead carcass scent too. It might be wise to keep a bottle of product on the shelf or the ingredients to make your own scent releasing shampoo. There is no way around the fact that what we think smells good is not your Weims idea of a great cologne. They don’t relish smelling of lavender, man’s cologne, or flowers. They might eat your flowers but the scent is another matter. Rotting flowers might be more appealing. Here are a couple of thoughts from profession dog trainers. No one can say for sure why a dog rolls in smelly stuff. 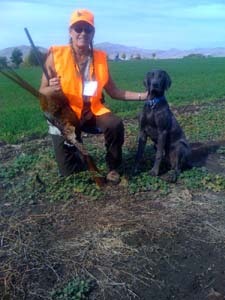 The hunting Weimaraner may well be using cammo (in the form of scent) like their hunting companion. They may also be bringing home a souvenir of their field trip. Punishment once again is not the answer. Though not pleasant to us, some dogs relish horse hockey. Upon locating a fresh supply of horse pooh, they not only roll in it but devour some too. Disgusting and offensive as the behavior is, it is not a personal affront. Regardless, you may be well advised to keep them on leash upon returning home. In this way, they cannot take the opportunity to deposit their treasured scent on the furniture. Who can imagine what they are thinking? Alas, maybe saving scent for future reference seems like a good idea. For the most part grooming your Weimaraner is pretty simple. An occasional bath and brushing, regular ear cleaning, and nail care. Of these the nail care is the biggest challenge. 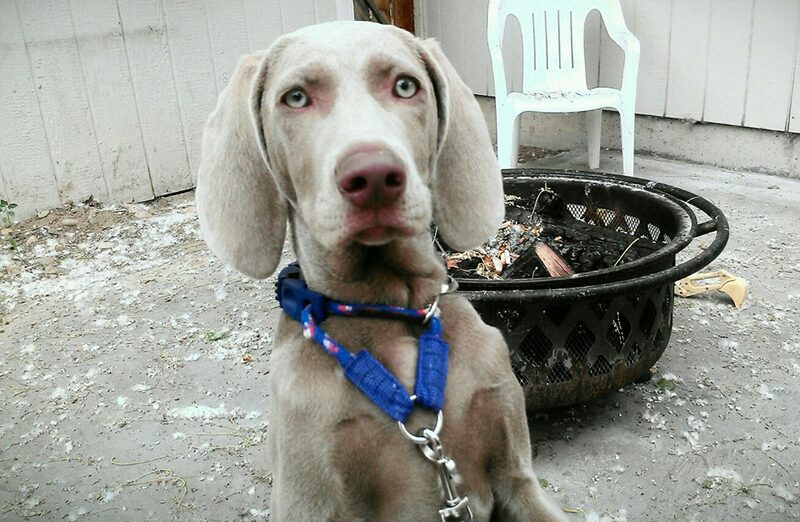 As with just about everything Weim related, it is best to get the process started early. It is also important to keep trimming or nail grooming frequent. This sets a routine and makes it easier if there is such a thing. Secondly, and equally important, it keeps the nails from getting too long. The longer the nail grows the further the quick extends in the nail. Long nails make close trimming difficult if not impossible without extra effort or expense. Other offices and groomers range in cost from $10 to $18 for a nail trim. As mentioned above, if the nail gets long there are other considerations. It takes frequent trimming to shorten the nail. As you carefully shorten the nail the quick will recede too. In speaking with groomers and Vet Techs about this problem we were advised that to get the nails back into shape takes several sessions. They tell clients to expect to come in every two weeks for at least two months. During these sessions your Vet Tech or Groomer would reduce the nail as close as possible to quick. Quicking a dog’s nail causes Hemorrhaging and is very painful. Most of us have cut our own nail too short and experienced throbbing sudden pain even without the bleeding. The Hemorrhaging nail is even more painful. If you quick their nail by accident there are several styptic products to help stop the bleeding. We prefer to use a good styptic powder but there are gels too. Some of the gels include pain relief medication. In a pinch you can use flour to help stop the bleeding. Another method of nail trimming is to use a nail grinder. Some folks use a regular Dremel tool. We often use our Dremel. We have purchased an attachment (for grooming the dog’s nail) that fits right on the Dremel. Since someone else has done a very long tutorial on how to use a Dremel there is no need for us to repeat that information. Here is the link to that article as well as a link to the attachment we have found useful. Lastly, there is a link showing a groomer using a Dremel on her client’s nails. Since most of us are not as skilled as the groomer, nor are clients as compliant we like the attachment. Your choice of tools needs to fit your comfort zone. It still requires getting your Weimaraner acclimated to the fact that nail trimming is going to happen. We own nearly every style of nail trimmer and find most of them get dull quickly. We do not own the razor style cutters that actually shave off a bit of the nail. Honestly, we have no experience with them but we have heard about this method. We do, however, have three various nail grinders. All three nail grinders work well. We tend to use the nail grinders more often than regular nail cutters. We have shied away from the less expensive Pedipaws brand nail grinders due to varied reviews. Reviews seemed to highly favor the more expensive Peticure nail grinder who makes the attachment for our Dremel. Even then the reviews indicated that the elite or more professional models were superior. In thinking we needed to replace our nail grinder we instead opted for the attachment for our Dremel. One reason we purchased the attachment was the main complaint even about the more expensive Pedicure models was battery longevity. Since our main reason for needing another nail grinder was due to our battery not holding a charge we felt avoiding the charging situation was the best scenario. In addition to the Dremel attachment, we purchased an Oster nail grinder that plugs in rather than uses a rechargeable battery. The cord is very long and the grinder has worked well for us. Pet Guys Sept Coupon has expired but watch for future coupons to be posted. The great price is good, and with a coupon the nail trimmer with quick sensor is even more affordable. We have seen these at the local pet store, however, the price was higher. Since we have not used one of these quick sensor clippers, we would love to hear about your experience.